This post is following the story of MySQL 8.0 Performance & Scalability started with article about 2.1M QPS obtained on Read-Only workloads. The current story will cover now our progress in Read-Write workloads.. 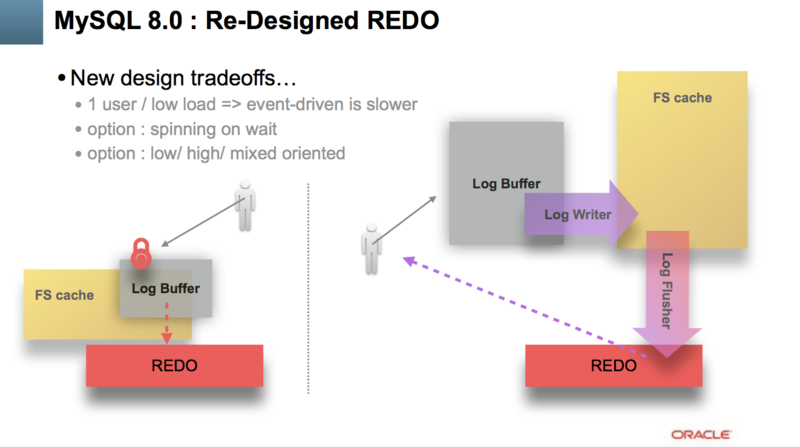 Historically our Read-Only scalability was a big pain, as Read-Only (RO) workloads were often slower than Read-Write (sounds very odd: "add Writes to your Reads to go faster", but this was our reality ;-)) -- and things were largely improved here since MySQL 5.7 where we broke 1M QPS barrier and reached 1.6M QPS for the first time. However, improving Writes or mixed Read+Writes (RW) workloads is a much more complex story..
REDO log contentions are blocking your whole transaction processing from going faster..
Transaction (TRX) management becomes very quickly a huge bottleneck as soon as your transactions are fast and/or short..
internal locking and row locking (LOCK) will quickly kill your performance as soon as your data access pattern is not uniform, etc..
and yet more, historically as soon as you're involving any IO operations, they all will go via one single and global locking path (fil_system mutex) which will make a use of faster storage solutions (flash) simply useless..
so within MySQL 8.0 GA timeframe we could not deliver all the fixes we have, and we have to go by priority here.. While this article will be mostly about the changes we're doing for REDO. 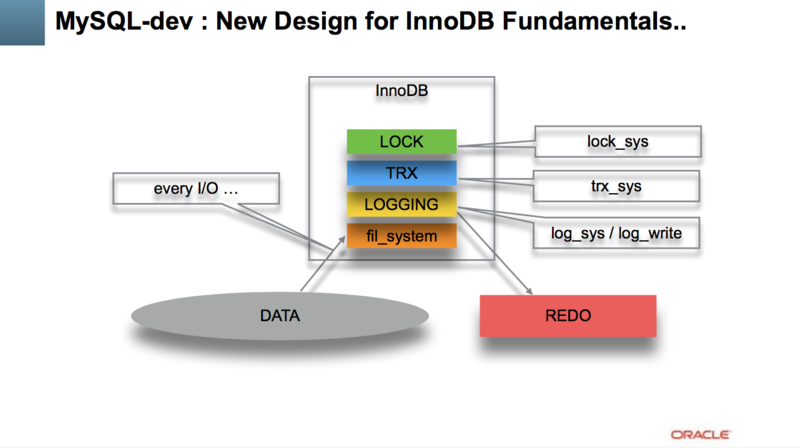 use innodb_flush_log_at_trx_commit=2 if you want a better performance and can accept to loose 1sec of last transactional activity in case of power off..
and the main key point in this perception is : "doing fsync to flush REDO is costly"
while even 20 year ago there were many storage solutions capable to greatly improve write performance (like arrays having battery-protected-cache on controller, or simple write-cache chips, etc.) -- which are particularly will be very efficient with REDO writes which as small and fully sequential..
however, most of the time the slowness of trx_commit=1 was mostly attributed to "frequent fsync calls" rather to REDO design itself..
our very fist suspects about REDO design started yet 2 years ago when Sunny implemented a probe dirty patch just to see the potential impact of a different approach in REDO queueing.. => which gave a completely unexpected result : surprisingly observed performance on the same RW workload was better with trx_commit=1 comparing to trx_commit=2..
after what it became clear that the whole issue is rather related to REDO design, while frequently involved fsync is not representing its main reason but just amplifying the problem..
During the past few years we came with several tentatives to improve InnoDB REDO log design, before to come with an understanding of what exactly do we need ;-)) -- our main target was to improve performance when trx_commit=1 is used (true security when we do flush REDO on every COMMIT), and from "do less fsync to improve performance" we came to conclusion "let's rather be driven by storage capacity". 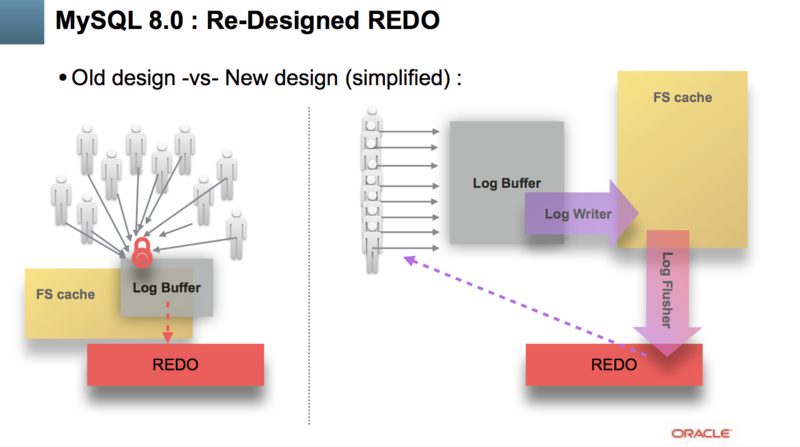 at the end, the whole processing rate will depend only on storage capacity to write REDO records fast enough ! This new model is only the first step in further REDO improvements. Currently by resolving bottlenecks on REDO layer, we're unlocking user threads to do more work, which is resulting in yet more hot bottlenecks on TRX and LOCK layers. So, there is still a lot of work ahead, and indeed, we're only on the beginning..
and a chain of events between different threads can hardly compete for efficiency -vs- a single thread which is doing all the work alone without any notification waits, etc..
one of the options : involve CPU spinning in thread waits, which is on cost of additional 20% of CPU usage allowing to catch the same TPS on 1-2 users comparing to what it was with old REDO, but already on 4 concurrent users load reach a higher TPS than before ! on the same time, TRX and LOCK bottlenecks are still remaining..
5.7 is really that worse -vs- 5.6 on this workload..
so, we're very happy to fix this gap finally with 8.0 ! other tuning details I'll explain in the next articles..
Also, I've intentionally skipped here all the problems related to InnoDB Double Write Buffer (the only feature protecting you today from partially written pages (except if you're using COW FS (like ZFS or similar)) -- this feature as it is became a huge bottleneck by itself.. -- our fix was ready yet for MySQL 5.7, but missed the GA timeframe, so was delayed for 8.0, where it met a list of several pre-requirement before allowed to be pushed, but finally it's only a question of time now to see the fix applied and delivered as part MySQL 8.0 features..
and THANK YOU for using MySQL ! but this was only about "overheads", and nothing about "scalability"
so, our main merit with MySQL 8.0 here will be rather NOT TO LOOSE the already obtained gain ! 2.1M SQL Query/sec for MySQL 8.0 -- our current new Max QPS record obtained in MySQL history ! which is great, no doubt ! however, there is a clearly seen small, but visible QPS regression on lower load levels..
well, adding it to my list of "low load" performance issues and will investigate later..
stay tuned, more to come..